All new material; DK's first LEGO NINJAGO reader! Kai, Zane, Cole, and Jay have fought many villains, from skeletons and snakes to the stone army and nindroids—but now it's time for them to discover some exciting new heroes and enemies! 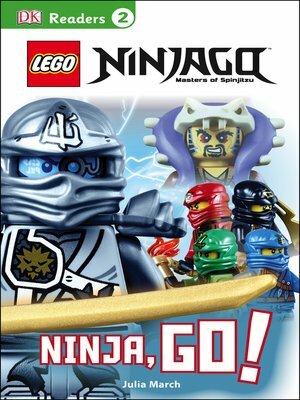 LEGO NINJAGO: Ninja, Go! includes coverage of brand-new LEGO NINJAGO 2015 minifigures and sets. Jump straight into the middle of the action as children's favorite Ninja warriors harness their powers in an awesome new adventure. Level 2 DK Readers are for children who have started to read on their own, but still need some help. These books contain more words, more complex stories, and smaller type than Level 1. They use slightly longer sentences that are still simple in construction. Information boxes provide lots of extra fun facts. DK Readers combine an enticing visual layout with high-interest, easy-to-read stories to captivate and delight young bookworms who are just getting started. Written by leading children's authors and compiled in consultation with literacy experts, these engaging books build reader confidence along with a lifelong appreciation for nonfiction, classic stories, and biographies.